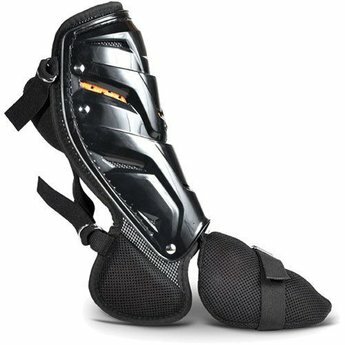 The System Seven D3O protective batting ankle guard provides the best in protection, function, and comfort. 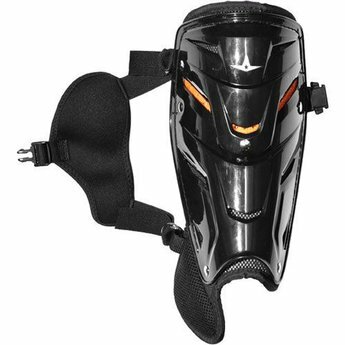 A low profile plastic shin plate combined with D3O and foam backing protects the front of shin, inside of leg, and the ankle bone. Foot padding features a custom molded and flexible D3O metatarsal guard providing maximum protection for the top and the inside of the foot. Elastic band wraps around foot to keep D3O guard in place. The metatarsal guard is conected to the shin plate using a durable and flexible band so that the protection stays right in place while batting and running the bases. Metatarsal protection is also removable if not needed. Low profile plastic shin plate. D3O System Seven Protective Padding. Custom moded and flexible D3O metatarsal guard (removeable). Single Clip Delta Flex Harness.